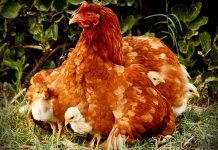 The value of regulating the photoperiod of poultry and livestock to stimulate reproduction has been recognized for many years and is used regularly by commercial poultry and livestock farmers. 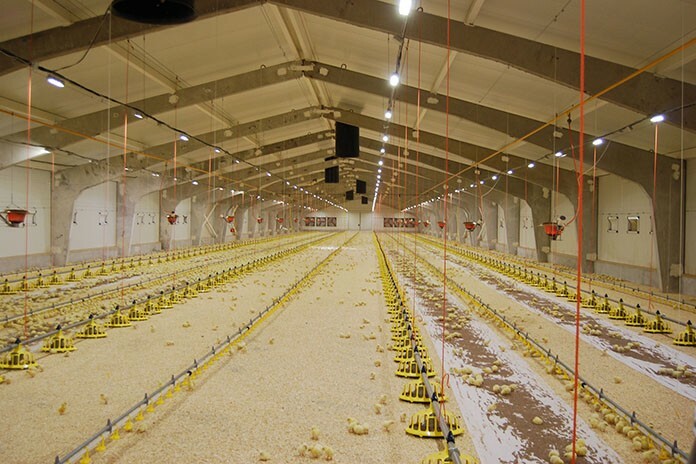 Now there are a wide variety of lighting programs and devices available to poultry producers, each of them with its own characteristics. 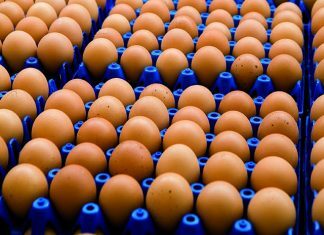 Many different types of light sources are utilized in the poultry industry, ranging from open houses under the influence of the sun to the most technologically advanced layer houses with the newest equipment without exterior light influence. Understanding the spectral composition of different light sources is important for selection amongst multiple lighting types. In equatorial regions, light from the sun is consistent from season to season. Full spectrum light ranging from UV to IR. 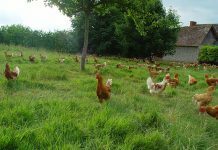 The response to sunlight changes from day to day and season to season are naturally inherent in both domestic and wild fowl. Poultry houses designed to utilize natural daylight may require little or no artificial light, saving on energy costs. The spectral composition and intensity. of sunlight changes from dawn to noon to dusk, from season to season, sunrise to sunset, and with cloud cover. Light intensity will change throughout the day as light will come in from different areas of the house. Light intensity is much higher from the sun than an artificial bulb, and overcoming seasonal changes in day length can be difficult. A bright sunny day can be 60,000 to 100,000 lux. High light intensity may cause aberrant behaviors such as nervousness, feather pulling, pecking and cannibalism. No difference in performance when used in cold weather. Short lifespan and must be frequently replaced. Usually constructed of metal and glass and are prone to breakage. More than 90% of the energy used by the bulb goes to heat rather than light. Many types of incandescent bulbs do not comply with new energy efficiency standards. Similar color spectra as incandescent bulbs. Available in both warm and cool spectra (K). Proven success in layer and breeder industries. Uncovered spiral tubes may be difficult to clean. Made out of metal and glass and are prone to breakage. Bulbs do not dim well, with the potential to burn out more quickly when dimmed. While appearing to be white light, CFLs are composed of light spectrum peaks depending on the color spectra phosphors utilized in the bulb. Bulbs require several minutes to reach maximum light intensity when turned on. Not ideal in situations where light must be turned on and off multiple times per day. Requires an electronic ballast to regulate current and voltage supplied to the lamp. Similar advantages and issues as CFL bulbs with some additional information. Dropdown tube lights allow for more uniform light distribution at all vertical levels in a multitiered cage or colony system. Casts a broad, even light in floor houses and fewer light fixtures required because of the higher output of a larger tube. Higher levels of glass and hazardous debris if broken. More difficult to store and transport safely. Can be more energy efficient than incandescent bulbs. Lack sufficient blue and green spectra. Provides a full spectrum of light. Typically the most efficient light bulb measured in lumens per watt. Because LEDs do not emit infrared radiation (heat), they can be constructed out of non-glass materials that are waterproof and shatterproof. Typically manufactured from non-toxic materials. Can be designed to focus the light onto desired areas. Color spectrum of the light can be adjusted depending on phosphors used. Easier to dim than CFL bulbs. Dimming can extend the lifespan of the bulb. Rapidly reaches peak light intensity after being turned on. Ideal for areas where lights are frequently turned on and off. Efficient in cold weather with no change in performance. Must use the proper dimmer, otherwise the light may flicker and burn out more quickly. LED light is directional and requires an appropriate lens to focus light, or appropriate diffusers to cover a broader area. May need to change wiring in a house to fit the ideal LED electrical specifications. a “jelly jar” for waterproofing. Lights may not burn out after expected lifespan but will be dimmed greater than 70% of original lumen output. As a result, baseline lux testing in the house may be required to determine when bulbs should be changed. 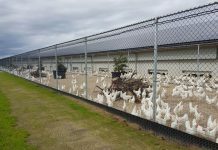 Cheaper LED lights may not have an appropriate heat sink, spectrum, hardware or warranty for poultry environments.